As The New York Times reports , on Saturday the US and other Western powers "threw their weight behind" Omar Suleiman, Egypt's vice-president, and his efforts to end the protests. US secretary of state Hillary Clinton yesterday urged patience, saying that reform "takes some time," and adding "there are certain things that need to be done in order to prepare." Clinton warned that "Revolutions have overthrown dictators in the name of democracy, only to see the process hijacked by new autocrats who use violence, deception and rigged elections to stay in power." But it is becoming clear that the American calls for an "orderly transition" are really giving support to the Mubarak regime's attempt to defuse the protests, regain control and forestall meaningful democratic change. When faced with a repressive regime that is determined to put down opposition and maintain its grip on power, "order" is not a virtue. 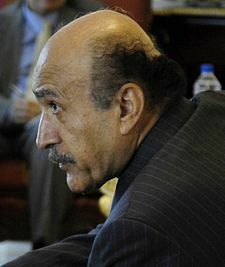 Suleiman has rejected the protesters' main demand, to end the dictatorship; instead, he has insisted that Mubarak must remain in office until the September elections. In fact, as the Times reports, he has moved to try to gain the upper hand over the protesters: "Police forces were returning to the streets, and an army general urged protesters to scale back their occupation of Tahrir Square." The Washington Post also noted this development: "Army units have increased their presence in and around Tahrir Square, parking tanks on every street. Although they have allowed the protests to unfold, military officials have gradually imposed obstacles - more checkpoints, more coils of razor wire, limitations on television cameras - and urged demonstrators to go home." In backing Suleiman, the US and the West are backing the Mubarak regime itself. Suleiman was appointed vice-president by Mubarak less than a week ago, and as the head of the Egyptian general intelligence service is thoroughly implicated in the undemocratic ruling order. As Jane Mayer highlights in The New Yorker, Suleiman "was the CIA’s point man in Egypt for renditions—the covert program in which the CIA snatched terror suspects from around the world and returned them to Egypt and elsewhere for interrogation, often under brutal circumstances." And he clearly wants to place an iron grip on the protests. When Mounir Fakhry Abdel-Nour of the opposition Wafd Party suggested that Suleiman repeal Egypt's emergency law, which allows the authorities to arrest without charges, Suleiman replied: "At a time like this?" Arrest without charges is what the US's call for "order" amounts to. Meanwhile, it appears that the established opposition representatives have blinked. The Post reports that the main opposition groups are no longer insisting on Mubarak stepping down immediately, and have entered into talks with Suleiman to reform the political system gradually. The opposition figures are a "loose coalition of political parties, intellectuals and protest organizers". The group includes leaders of the Muslim Brotherhood, which has been banned from operating in the political sphere. Many in the West portray the Muslim Brotherhood as a dynamic and threatening Islamic group that will take over if the Mubarak regime falls, but in fact it is not that influential and does not have the support of the majority of the people, especially the protesters (see here, here and here). Now, ironically, it is the regime and the West that are effectively re-establishing the Muslim Brotherhood as a player in Egypt's politics. The good news is that it looks like the protesters are having none of this compromise from these "opposition" figures. They are sticking to their demands, and recognize the regime's ploy for what it is. "All these attempts at putting people to sleep by responding to very marginal demands is just a tactic to gain time," said the Muslim cleric Hafez Moussa, according to the Post. "As soon as the people leave the square, he will take his revenge on all of them." The political figures meeting with Suleiman do not represent the masses; they "are all completely irrelevant," says Hisham Kassem, an Egyptian political analyst and journalist. "The people on Tahrir Square wouldn't recognize them, or else would barely give them the time of day." The US is propping up a regime that has no legitimacy, no right to rule. Neither the regime nor the US can bring democracy; only the Egyptian people can do that. There are ominous signs that the ruling clique and army are preparing for a bloody crackdown in the Square - and the US and the other Western powers will have paved the way with their calls for "order".